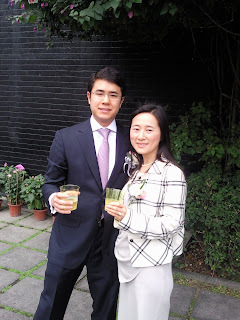 Today, I had the honour of being a witness to my younger brother Arnaud's wedding with Nancy Chan. Unusually clear and pleasant weather in Hong Kong for the winter season. A simple registration ceremony at the government office followed by Champagne in the small park outside. Arnaud and Nancy's close friends had been invited and Nancy's mother was the other witness to the wedding. Nancy and her mother being strict vegans, we were all treated to a deliciously healthly lunch of vegetarian dim sum at Lok Cha tea room inside the Hong Kong botanical garden. Great Chinese tea selection and elaborate selection of vegan food. It was a great afternoon. Funny seeing my brother Arnaud with a ring at his finger; he's never worn jewelry before.